Do you know that even if you are a practical cook, you can still create a festive mood at home? Serve your family special dishes without having to spend much money. Surprise them with a special homemade, deep fried turkey. You might think it’s an expensive thing to do, but it doesn’t have to be. There are plenty of cheap turkey fryers for less than you might think. More so, you might find the turkey fryer expensive that you need to shell out hundreds of dollars for one. Well, here’s the great news! You can own a turkey cooker at such a reasonable price. Here, we have come up with a list of the Top 5 Cheap Turkey Fryers to still let you serve delicious turkey minus the high cost. Find the Cheap Turkey Fryer that’s Right for You! Our reasons for selection and inclusion of these products in our list are the features, quality and most of all, the price which you, as a practical homemaker will surely agree. 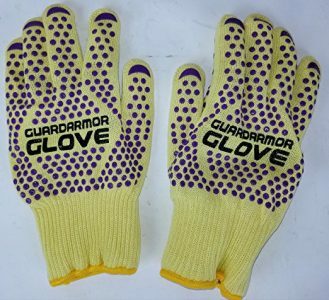 As we do in our other Top 5’s, our No.1 is the cheapest, and yet, it is of high-quality. The last in the list may be the most expensive but undoubtedly still affordable. Read on and find which one suits your budget and preferences. 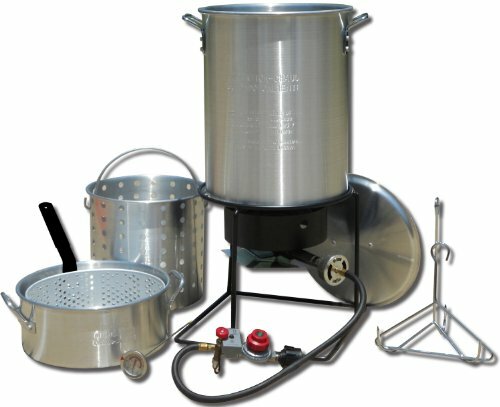 The King Kooker Turkey Fryer Kit is the first in our Top 5 Cheap Turkey Fryers as it is the most affordable. It cooks dishes on propane so this means, you can cook the turkey outdoors only. This is ideal for you if you want to turn ordinary days into special ones. This turkey frying kit cooks smaller turkeys best. A 12 to 15-pound turkey is so perfect for this best-selling cookware piece. If you’re looking to cook a giant, you’ll want to stick with the Grand Gobbler from Bayou Classic. 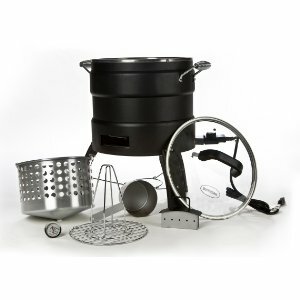 The King Kooker Turkey Fryer Kit comes with a 29-quart pot. The package also includes a lifting kit and rack. In other words, this turkey fryer has everything you need but the propane tank for your deep-frying outdoors. Why wait for the next Thanksgiving, Christmas Day or Easter celebration when you can serve Turkey now? Impress your whole family and all your friends with the fried turkey’s moist meat and crispy skin. Here’s the better news! You can deep-fry the turkey in just a few minutes. Forget about the hours and hours of baking in the oven. 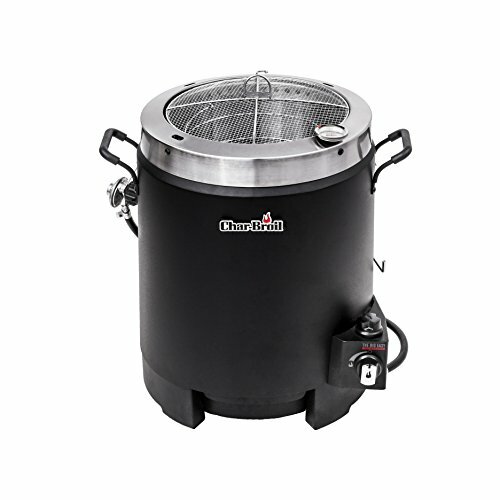 Second in our list is the Masterbuilt Butterball Indoor Electric Turkey Fryer. We ranked it second as it is the next most affordable among our five best turkey fryers here. You’ll be more impressed especially that it is the No.1 bestseller in turkey fryers. Our second best is a perfect choice for you if you prefer bigger and heavier turkey. You can cook up to 20 pounds or nine kilos of turkey with this fryer. Do you want to do other things at home while you prepare the turkey for a special meal? Then, this turkey fryer is the best for you. It is an indoor electric turkey fryer so you can leave your turkey inside it while attending to the other chores. Since this is an indoor cooker, expect the Maserbuilt Butterball Indoor Electric Turkey Fryer to be lightweight and compact. It is certainly safe and easy to use this cooking equipment. It also perfectly fits your countertop. 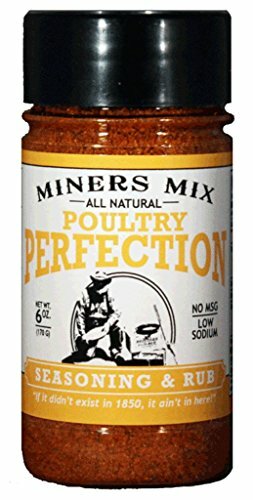 A lot of homemakers who have this have already attested that their turkeys come out delicious-moist inside and crispy skin outside. And the best thing about it is that, they are able to cook their turkey in just a short time. 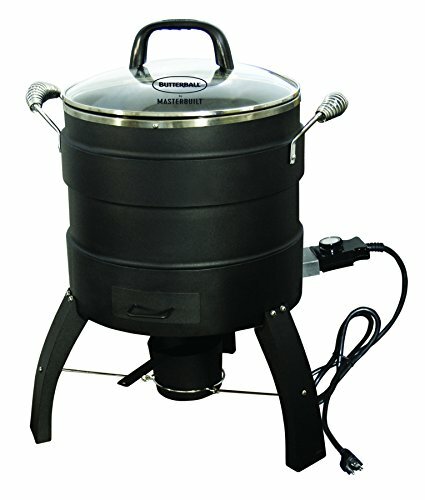 Like our second in the list of Top 5 Cheap Turkey Fryers, the Kamp Kitchen Turkey Fryer also doesn’t cost an arm and a leg. It is one of the outdoor turkey fryers running on propane. 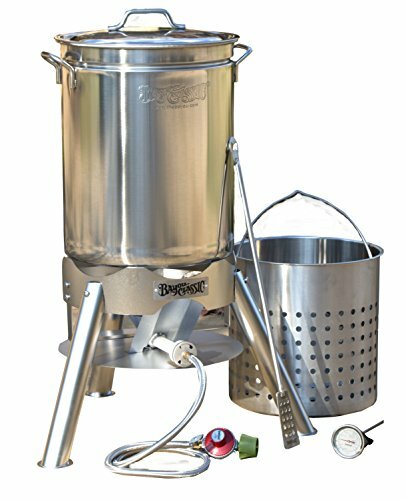 It comes with everything a cooking enthusiast needs for deep-frying the turkey outdoors. Isn’t this quite a reasonable choice for individuals like you who are looking forward to deep-frying turkey for their loved ones on special events? You are sure to achieve a restaurant taste with this one. 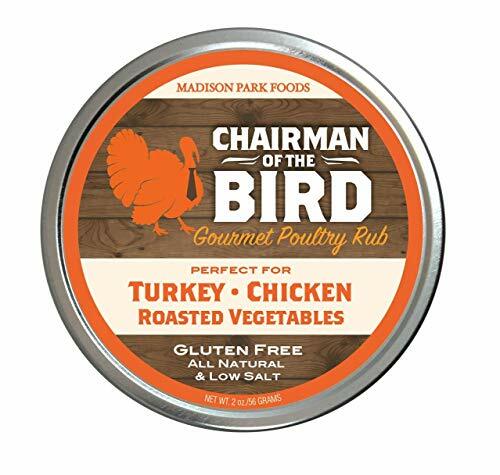 When you use this, your deep fried turkey is guaranteed moist and juicy inside and crispy outside. If it is your first time to taste deep fried turkey, you sure, won’t ever go back to roasting it in the oven again. What’s even better about this turkey fryer is that, it frees space inside your kitchen as this kitchen equipment is for outdoor use. 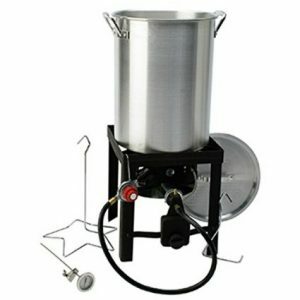 Our 3rd in the Top 5 cheap turkey fryers comes with an aluminum pot and lid; a stand; a burner with stand; a heat shield (for wind protection), and a turkey lifter and rack. 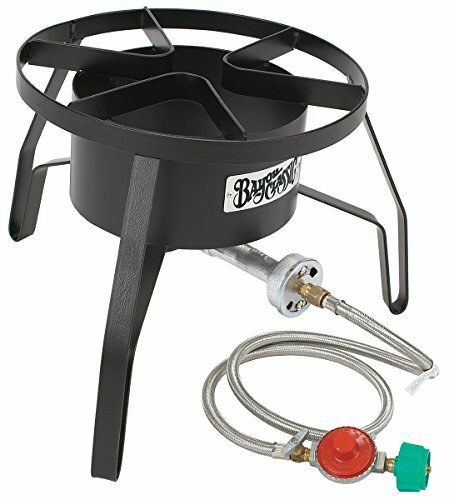 You’ll surely like the burner that puts out a forceful 38,000 BTU. This means that your oil quickly heats up and retains the heat the moment you put your turkey in. The Butterball Oil-Free Electric Turkey Fryer and Roaster is still affordably priced. It is one of the turkey fryers with the highest rating on Amazon. This is an indoor turkey fryer so it is light in weight and it surely does not consume too much space in the kitchen. If you are a simple homemaker who serves special dishes for the family, this one’s for you. You can cook turkeys of up to 14 pounds inside minus the oil. Isn’t this an excellent choice considering its health benefit because of the absence of oil? The majority of the reviews about the Butterball Oil-Free Electric Turkey Fryer and Roaster guarantee that this oil-less cooker cooks turkey that’s moist inside and crispy outside. It is almost the same as the deep-fried turkey, thus, without the oil and calories. Busy moms can still cook turkey even if there’s no special occasion. This is simply because it can cook turkey at roughly ten minutes in every pound. Therefore, a turkey weighing 14 pounds takes only up to two-and-a-half hours to cook completely. This is definitely speedier than any conventional oven. Basket holds turkeys up to 18 lbs. 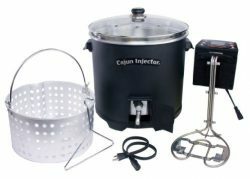 Our last in the Top 5 Cheap Turkey Fryers, the Cajun Injector Deep Fryer, is an indoor turkey deep fryer designed to fry 12 to 14-pound turkey. You can also deep-fry other dishes than turkey like seafood and any other meat dish. 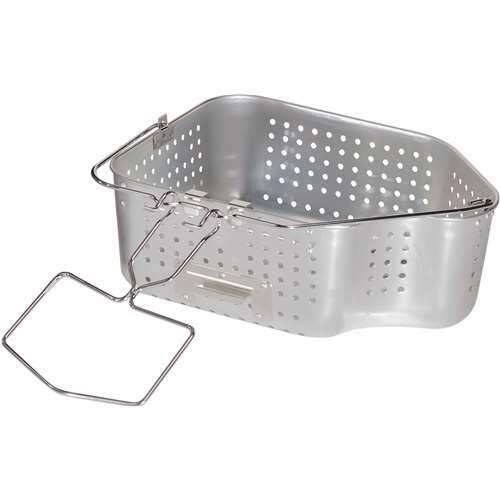 This comes with a detachable basket making the draining of the oil easier for you. You can do other chores at home while your turkey is cooking as it automatically shuts off when done. Simply set the timer and the digital thermometer will tell you if the heating is right. This turkey fryer also features a swing-out drain valve beneath for easy and simple cleaning. You don’t have to worry about the status of your turkey. The clear lid on top will tell you when the dish is completely cooked or needs more time for cooking. Here’s what’s amazing with the Cajun Injector Turkey Fryer. 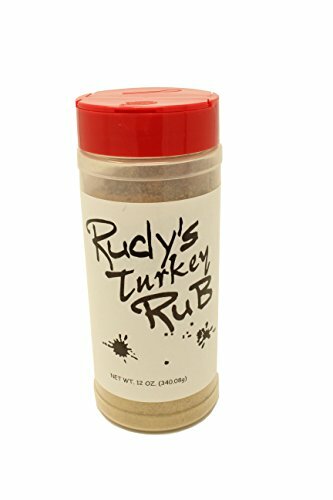 Turkey and other dishes are not the only ones you can cook with this one. You can also enjoy home-brewed beer using this bestseller! A lot of owners of this turkey fryer have already testified that they can boil wort much faster than the stove-top, not to mention its safety when boiling. 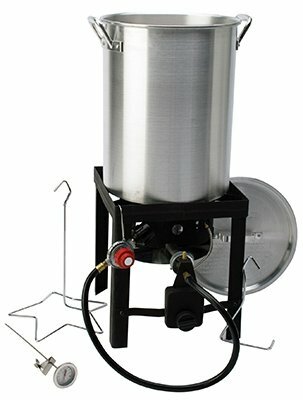 Cheap Turkey Deep Fryers: Have your Say! What’s your top pick for a cheaper turkey fryer? Leave a comment below and let us know your thoughts.